Lars Fredrik Nilson and his team detected this element in the minerals euxenite and gadolinite. He prepared 2 grams of scandium oxide of high purity. 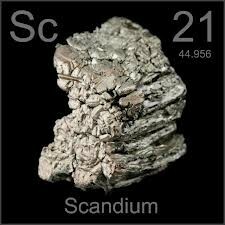 He named the element scandium, from the Latin Scandia meaning "Scandinavia". Lars was unaware that a man named Dmitri Mendeleev had predicted an element similar to Scandium existed. Metallic scandium was produced for the first time in 1937 by electrolysis of a eutectic mixture, at 700–800 °C, of potassium, lithium, and scandium chlorides. The first pound of 99% pure scandium metal was produced in 1960. Scandium is commonly used with aluminum due to the fact that it limits the excessive grain growth that occurs in the heat-affected zone of welded aluminum components. This has two beneficial effects: the precipitated Al3Sc forms smaller crystals than are formed in other aluminum alloys and the volume of precipitate-free zones that normally exist at the grain boundaries of age-hardening aluminum alloys is reduced. Both of these effects increase the usefulness of the alloy. The main application of scandium by weight is in aluminum-scandium alloys for minor aerospace industry components. These alloys contain between 0.1% and 0.5% of scandium. 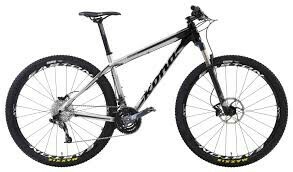 Scandium is also used in sports equipment such as baseball bats, lacrosse sticks, and bicycle frames. Smith & Wesson have also been known to use Scandium in the frames of their revolvers. The frame of this bicycle uses Scandium. This bat is also made from some Scandium. 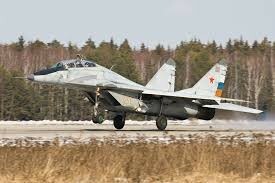 This plane uses a Scandium and aluminum alloy outer frame. 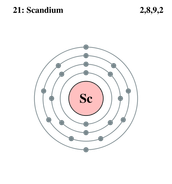 Scandium has 4 outer shells, with 2 on the first, 8 on the second, 9 on the third, and 2 on the outermost shell. The electron configuration of Scandium is 1s2, 2s2p6, 3s2p6, 4s2p1. 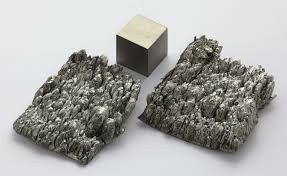 Scandium's most common oxidation state is +3, with the +2 and +1 oxidation states being rarer but nonetheless possible. Scandium is a soft metal with a silvery appearance. It develops a slightly yellowish or pinkish cast when oxidized by air. It is susceptible to weathering and dissolves slowly in most dilute acids. It does not react with a 1:1 mixture of nitric acid (HNO3) and 48% hydrofluoric acid (HF), possibly due to the formation of an impermeable passive layer. Scandium turnings ignite in air with a brilliant yellow flame to form scandium (III) oxide. Scandium oxide reacts with most acids upon heating, to produce the expected hydrated product. For example, heating in excess aqueous HCl produces hydrated ScCl3 and nH2O. Scandium reacts with 15M of HNO3 to form Sc(NO3)3. When exposed to 6 M of NaOH, no reaction occurs. Scandium is solid at room temperature. Heat of fusion is 15.9 kJ/mol, while heat of vaporization is 305 kJ/mol. Density is 3 g/cm3. Atomic volume is 15 cm3/mol. Atomic Radius is 163 pm. It has a electronegativity of 1.36. Scandium has a boiling point of 3021 K and a melting point of 1812.2 K. The three ionization levels are 631kJ/mol, 1235kJ/mol, and finally 2389 kJ/mol. Electron affinity is 18.1 kJ/mol.